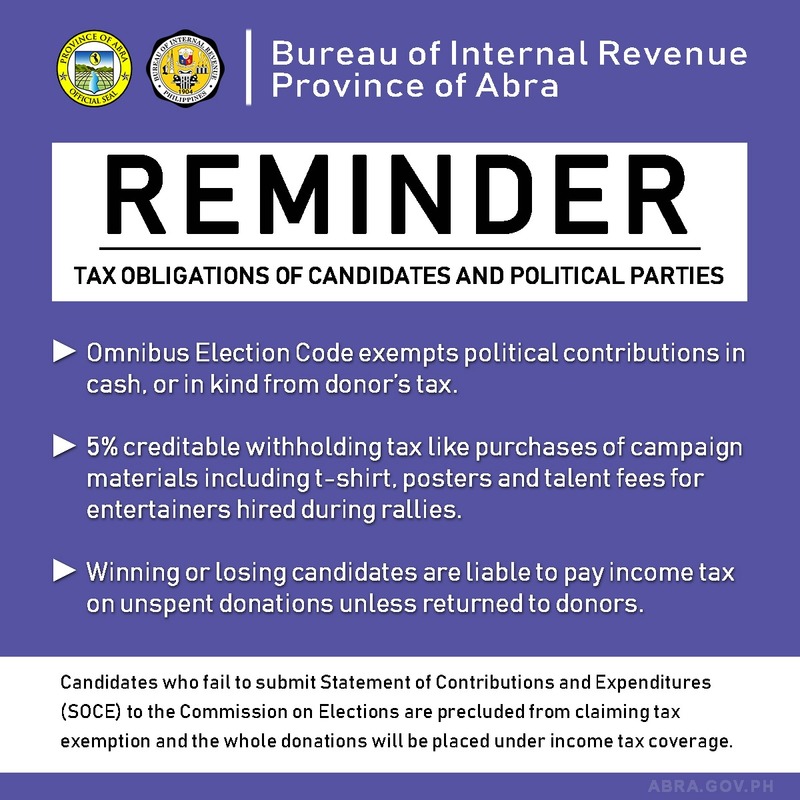 The Bureau of Internal Revenue (BIR) District Office-Abra is reminding candidates and political parties on their tax obligations as the official campaign period for the May midterm elections starts next month. The Omnibus Election Code exempts political contributions in cash or in kind from donor’s tax. According to BIR-Abra OIC Revenue District Officer Frumencio A. Belisario, election-related expenses are subject to five percent creditable withholding tax like purchases of campaign materials including t-shirts, posters, and talent fees for entertainers hired during rallies. Under Revenue Regulations 7-2011 and Revenue Memorandum Circular 30-2016, winning or losing candidates are liable to pay income tax on unspent donations unless returned to donors. The unused donations shall be included in the income tax return of the candidates in the year it was received. Belisario also said that candidates who fail to submit Statement of Contributions and Expenditures (SOCE) to the Commission on Elections are precluded from claiming tax exemption and donations will be placed under income tax coverage. The circular stated that political contributions are not for the candidates’ personal disposal, but to solely fund the campaign.